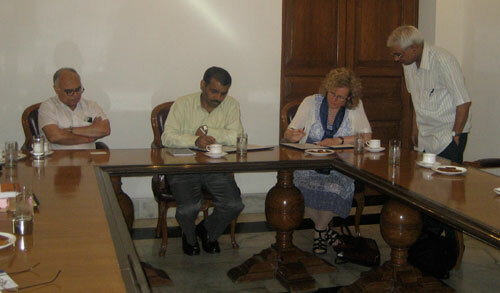 At the end of April 2010, Dr. Anna Lindberg, Director of SASNET, visited New Delhi. She was part of a delegation from Lund University (LU) along with Pro Vice-Chancellor Eva Åkesson; University Director Marianne Granfelt; and staff members Sidsel Hansson and Henrik Hofvendahl from the Office of International Relations. The original delegation was larger but five Lund University deans were unable to rebook their tickets after airlines were grounded due to problems caused by ash from the Icelandic volcano. The purpose of the trip was multifaceted: visits to a few leading universities in order to discuss further collaboration, participating in the annual convocation of Universities 21 (U21) members, and a meeting with the Indian Ministry of External Affairs. On April 26, Marianne Granfelt and Anna Lindberg met for one hour with T.P. Seetharam, Joint Secretary of the Central Europe Division at the Ministry of External Affairs, Government of India, to discuss LU’s proposed hosting of a guest professor from India. SASNET had raised this issue earlier with the Indian Ambassador to Sweden, H.E. Balkrishna Shetty, who arranged the meeting at the Ministry of External Affairs. Stefan Jonsson, Science and Technology Counsellor at the Swedish Embassy in Delhi, participated in the discussions. It was gratifying to learn that the Indian Government supports the idea of sending a guest professor to LU. Travel costs and salary would be borne by the Indian Government, and LU would provide living accommodations, office space, and an honorarium. 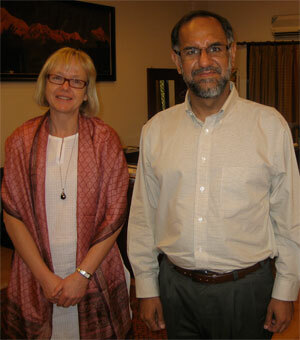 Lund University Director Marianne Granfelt with Navdeep Suri, Joint Secretary of Public Diplomacy, Ministry of External Affairs. Marianne Granfelt, Stefan Jonsson, and Anna Lindberg next attended a meeting with Navdeep Suri, Joint Secretary of Public Diplomacy, Ministry of External Affairs, Government of India. Under consideration were various forms of collaboration between Indian universities and LU, such as support for seminars and other events at LU or in India, whose participants would come from India, Sweden, and other Nordic countries. Marianne Granfelt and Anna Lindberg also met with Yogeshwar Varma, Deputy General Director of Indian Council for Cultural Relations (ICCR), to consider details of a Memorandum of Understanding concerning the proposed visiting guest professorship. It is hoped that this position at LU can be filled for the academic year 2010–2011. On the following day, April 27, the five-member LU delegation visited Jawaharlal Nehru University (JNU) for a meeting conducted by Professor Ramadhikari Kumar, Special Advisor to the Vice-Chancellor. He outlined the organization, educational system, and research activities at JNU. Pro Vice-Chancellor Eva Åkesson then gave a presentation about LU. With regard to cooperation, those at the meeting agreed that collaboration between the two universities will mainly take place in the field of research. Specifically mentioned as fruitful area of collaboration was peace research. Anna Lindberg and Henrik Hofvendahl also visited the School of Social Sciences and met with Professor Ravi S. Srivastava (photo to the right), Chairperson for the Study of Regional Development. We discussed the possibility of holding joint workshops for researchers from JNU and LU, possibly other Swedish or Nordic Universities as well. It was decided that a comparative perspective would be especially fruitful. Two topics cited were the social protection of an ageing population and environmental changes. 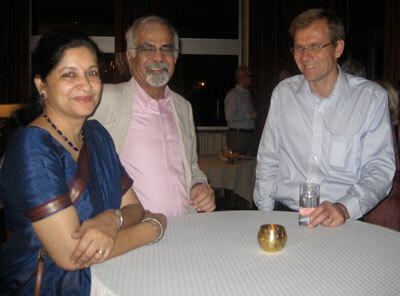 Prof. Ravinder Kaur, IIT Delhi, with husband and Anders Sjöberg, hosting the reception at the Swedish Embassy in New Delhi. On Tuesday, April 27, Anders Sjöberg, Deputy Head of Mission at the Swedish Embassy in New Delhi, hosted the Swedish delegation and several guests from Indian universities and institutes for a dinner reception. Mr. Sjöberg is nearing the end of his tenure and will soon be succeeded by Mattias Lentz, who is currently at the Swedish Embassy in Beijing. On Wednesday, April 28, the delegation visited the India-EU Study Centres Programme (IESCP) in New Delhi and met with D. Vasudevan, IT Expert and Web Specialist, and Kamal Gaur, Education Administration and Management Expert. Their tasks are to support existing India EU Study Centers with technical assistance, encourage the establishments of new such centers, and issue a newsletter (see http://www.iescp.org/). It was very encouraging to learn that the SASNET Gateway and our newsletters serve as a model for IESCP. Finally, the delegation made a short visit to Delhi University to sign a Memorandum of Understanding. Also taking part in the event were R.K. Sinha, Registrar; Professor Tandon Sampat Kumar, Pro Vice-Chancellor; Professor Kondepudy Sreenivas, Dean of International Relations; and Professor Rajni Palriwala, Dean, Faculty of Social Sciences. SASNET had already met with Professor Sreenivas in November 2007 (more information), resulting in a fruitful collaboration between LU and Delhi University through the first Indo-European Erasmus Mundus External Cooperation Window Programme (more information) coordinated by LU and in which Delhi University plays a central role. It is hoped that other forms of collaboration will follow.